The fuel price hike evoked sharp criticism from all across the political spectrum — Right, Left and the Centre — and in a rare unanimity they demanded that the Centre reconsider the steep hike in petrol and diesel prices. Communist Party of India activists shout slogans against the Central Government while standing on a police barricade during a protest against the increase in petrol and diesel prices in New Delhi on Tuesday. Would it be proper to regularise illegal constructions in Punjab? Slain BJP leader Pramod Mahajan's son Rahul, arrested on charges of drug abuse, was today remanded to two-day police custody by a local court. Metropolitan Magistrate A K Chaturvedi sent him to police custody till June 8 as he was produced before the court by the Delhi police after his discharge from Apollo hospital. Rahul Mahajan being taken by the police after his discharge from Apollo Hospital in New Delhi on Tuesday. The Army foiled a major infiltration bid and killed eight infiltrators on the LoC in Machchil sector of Kupwara district early this morning. 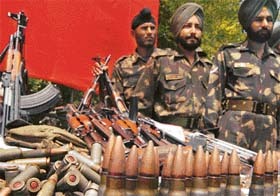 A huge cache of arms and ammunition seized by the troops from the Kashmir valley. Veteran filmmaker Hrishikesh Mukherjee is critically ill with chronic renal failure and has been admitted to Mumbai’s Lilavati Hospital. Mukherjee was brought in on Saturday after he contracted pneumonia and sepsis, according to a bulletin put out by the hospital. Sensex lost 256 points today to close at 9,957. After touching a high of 10,192 in intra-day trade, it closed below 10,000 for the first time after February 17. Nifty shed 2.6 per cent or 79 points to end at 2937. In a bid to resolve the Haryana liquor auction issue, the Supreme Court today mooted a proposal for the fresh bid of 1,140 “non-auctioned” vends which were allotted by the state government through “negotiation” after not finding sufficient claimants as the vends were located in rural areas. Prime Minister Manmohan Singh today set aside protocol and went to the airport to receive Nepalese Prime Minister Girija Prasad Koirala who arrived here this evening on a four-day goodwill visit. About a year and a half after the recommendations of the AV Singh Committee on cadre restructure was implemented, short service commission officers, including a number of women officers, continue to draw their old rank pay.